Sixteen hundred Scientologists and their guests packed the street in front of 300 West Harrison in Seattle today for the opening of the new Church of Scientology of Washington, a milestone for the congregation formed 54 years ago. Duwamish Tribal Chairman Cecile Hansen, a descendant of Chief Seattle after whom the city was named, opened the event with a centuries-old ceremony, welcoming the Church to its new home. “Just this year alone, we have opened six new Ideal Churches on three continents. While in months to come you’ll see ribbons parting as far away as Tel Aviv, Melbourne and Moscow, and as close to home as Twin Cities, Sacramento and Portland—to cite but a few of the more than 60 new Churches now looming on the near horizon. Acknowledging the Church for its many contributions to the community were Washington State Supreme Court Justice Richard Sanders, Washington State Representative Marilyn Chase, Queen Anne Chamber of Commerce President Dave Peterson, Seattle Neighborhood District Coordinator Christa Dumpys, and FEMA volunteer liaison Jo Ann Oram. Long active as volunteers in community betterment initiatives, just last April local Scientologists received the Queen Anne Chamber of Commerce Community Service Award. Seattle-area Scientologists serve in the Washington Voluntary Organizations Active in Disaster (VOAD) and as certified associate chaplains of the Seattle Police Department’s Community Chaplaincy Program. The Scientology Environmental Task Force, partnering with the Seattle Parks & Recreation Department, Department of Neighborhoods and Seattle Public Utilities to Keep Seattle Beautiful, sponsors the oldest Adopt-A-Street program in the city. Scientologists have also volunteered with Food Lifeline since 2002 and, since 1993, the Church’s community drug education program has helped thousands of Seattle young people steer clear of substance abuse. The State of Washington holds a significant place in the life of Scientology Founder L. Ron Hubbard. In 1923, he joined Tacoma Troop 31 Black Eagle Patrol and the following year, at 13, became the youngest Eagle Scout in America. In 1926, he spent his sophomore year at Seattle’s Queen Anne High School on Galer Street, before embarking on the first of several voyages to a then rarely visited Asia. During the 1930s, in his Port Orchard writer’s retreat overlooking Puget Sound, Mr. Hubbard authored several acclaimed stories and novels for what is remembered today as the Great American Pulp Fiction Movement. It was also in Port Orchard that he scripted the Warner Brothers classic Dive Bomber. It was also from Seattle where Mr. Hubbard set sail on the famed “Alaskan Radio Experimental Expedition” to field-test a then novel system on which all future radio navigation was based. Most importantly, it was in neighboring Port Orchard, in 1938, that Mr. Hubbard authored what is remembered as the philosophic foundation of Dianetics and Scientology. A now legendary work entitled “Excalibur, ” here was the first examination of key universal principles common to all life forms and underlying all behavior. The new Church of Scientology of Washington is located just blocks from Seattle Center and the Space Needle. The ground floor features an extensive Public Information Center with 17 multimedia displays that present and illustrate Scientology beliefs, the life and legacy of L. Ron Hubbard and the full array of social betterment and community outreach programs. These interactive displays provide a concise but panoramic view of the religion to visitors, students and others desiring to learn more about Scientology. To even better serve the community, the Church has further established the Scientology Life Improvement Center adjacent to the century-old Pike Place Market Historic District, the “Soul of Seattle.” This center provides Scientology introductory courses. Last year (2009), new Churches of Scientology opened in Washington, DC; Rome, Italy; Nashville, Tennessee; Dallas, Texas; and Malmö, Sweden. These join a roster of new Churches of Scientology recently opened in world cultural centers, including the Church of Scientology of San Francisco, in the original historic Transamerica Building; the Church of Scientology of New York, just off Times Square; the National Church of Scientology of Spain, in Madrid’s Neighborhood of Letters; the Church of Scientology of London, at the city’s epicenter; and the Church of Scientology of Berlin, near the Brandenburg Gate. Another five new Churches of Scientology are scheduled for completion before the end of 2010. Worldwide, there are more than 8,500 Scientology Churches, Missions and affiliated groups in 165 countries. A 25-piece marching band welcomed over 4,200 to the Grand Opening of the new Church of Scientology of Pasadena today. Mr. David Miscavige, Chairman of the Board of Religious Technology Center and ecclesiastical leader of the Scientology religion, officiated, welcoming dignitaries, parishioners and guests to the Church’s new 58,000-square-foot facility. Also commemorating the occasion were Pasadena Mayor Bill Bogaard; Pasadena Heritage board officer Teresa Grimes; Chamber of Commerce President and CEO Paul Little; and Pasadena Ministerial Association President Dr. Nicholas Benson. The character of this turn-of-the-century historic monument was preserved in a unique blend of old and new. Its heritage is reflected in the restored Beaux Arts exterior, its classic four-story galleria-like atrium as well as Arts & Crafts style furnishings, stained-glass windows and Victorian accents throughout. Attention to 21st-century energy-conscious planning and construction also meets LEED (Leadership in Energy and Environmental Design) requirements for environment-friendly building materials, energy equipment, lighting systems, reduced water consumption and more. The new Church features an extensive Public Information Center with 17 multimedia displays that present and illustrate Scientology beliefs, the life of its Founder, and the full array of its many social betterment and community outreach programs. In full, these displays provide a concise but panoramic view of the religion to visitors, students and others desiring to learn more about Scientology. The building features a Chapel seating hundreds, a library containing all Church Scripture, as well as a multitude of seminar rooms, film rooms and volunteer workspaces for its many social betterment and community programs and projects in addition to course and counseling rooms to provide Scientology training and auditing for parishioners. The Church of Scientology of Pasadena is the sixth new Scientology Church (and the second in Los Angeles County) to open in 2010. On January 23 this year, the Brussels branch of Churches of Scientology for Europe opened in Belgium; the Church of Scientology of Quebec opened January 30; the Church of Scientology & Celebrity Centre of Las Vegas opened February 6; the Church of Scientology Los Angeles opened April 24; and a new National Scientology Church opened in Mexico City July 10. Last year, new Churches of Scientology opened in Washington, DC; Rome, Italy; Nashville, Tennessee; Dallas, Texas; and Malmö, Sweden. These join a roster of new Ideal Churches of Scientology recently opened in world cultural centers, including the Church of Scientology of San Francisco, in the original historic Transamerica Building; the Church of Scientology of New York, just off Times Square; the National Church of Scientology of Spain, in Madrid’s Neighborhood of Letters; the Church of Scientology of London, at the city’s epicenter and the Church of Scientology of Berlin, near the Brandenburg Gate. Another six new Churches of Scientology are scheduled for completion before the end of 2010. Worldwide, there are more than 8,500 Scientology Churches, Missions and affiliated groups in 165 countries. The Church of Scientology has been a strong community drug education activist for decades mainly because research by Scientology Founder L. Ron Hubbard in the 1960s showed that drugs abuse not only has a social and personal health liability, it also hinders spiritual enlightenment. But even before that information came into my frame of reference, I had witnessed in my own years as an NFL tight end in the 1970s with the Steelers and Patriots many men of fantastic potential ruin their careers and personal relationships and die through drug abuse. President Obama’s new revised approach to bring on more drug education is significant and sensible, because a wider look at the havoc that results from ignorance of what drugs are and do, is a real eye opener. A new drug education documentary from the Foundation for a Drug-Free World which is available on the Internet and is based on interviews of over 200 former addicts, tells the real tale. In addition to proving the obvious—no one decides to become addicted to drugs—what is more meaningful is that one for one they had no clue where that joint, pill or drink would take them. Statistics-wise, according to a March 2010 National Drug Intelligence Center report, the economic cost of drug abuse and trafficking is $215 billion annually, which omits the cost of drug-related crime. Abuse of prescription drugs has exploded (treatment admissions from 1997-2007 for prescription painkillers increased by more than 400 percent) and abuse of illicit drugs is commonplace. For more information on the Church’s anti-drug initiative, visit the Scientology website. Rev. Adams can be contacted him at (323) 960-3500 or on email at BobAdams@Scientology.net. Churches of Scientology around the world celebrate the original release of the religion’s first book this weekend. Published May 9, 1950, Dianetics: The Modern Science of Mental Health became an overnight success and has been a continuing bestseller for 60 years. The work is the anatomy and full description of a portion of the mind that is the source of nightmares, unreasonable fears, upsets and insecurities. More than 20 million copies have been sold. Based on author L. Ron Hubbard’s researches into the mind and human behavior prior to 1950, its release brought on the spontaneous formation of 750 Dianetics groups around the U.S. and establishment of the Hubbard Dianetics Foundation in Elizabeth, New Jersey. Mr. Hubbard lectured, instructed and otherwise met a staggering demand, while continuing research into the fundamental nature of man culminating in the founding of the Scientology religion in 1952. Today, Dianetics remains a key substudy of the greater body of Scientology Scripture, its perennial popularity sustained by its workability. Before Dianetics, prevailing scientific thought held that Man’s mind was his brain, nothing more than a collection of cells and neurons, and IQ and personality were considered fixed and unchanging. With Dianetics, IQ and personality improved, its effectiveness documented in a multitude of case histories over more than half a century of application. In 2009, Mr. David Miscavige, Chairman of the Board of Religious Technology Center, announced the completion of translation in 50 languages of Dianetics and seven other basic Scientology books. Mr. Miscavige also released 32 new films of visual instruction in Dianetics procedures on DVD, part of a special Hubbard Dianetics Seminar now offered at Churches of Scientology, which include turnabout application of Dianetics procedure. Dianetics: The Modern Science of Mental Health is published by Bridge Publications and is available in 125,000 libraries in over 180 countries as well as public bookstores and Churches of Scientology. Dianetics Anniversary celebrations are open to the public. The opening of the new Church of Scientology and Celebrity Centre Nashville on April 25, 2009, just one mile from “Music Row,” drew Scientologists from across the region. Also on hand were scores of local dignitaries, residents and Hollywood celebrities. Among those who addressed the gathering were Grammy-winning composer and musician Mark Isham and actresses Anne Archer and Jenna Elfman. 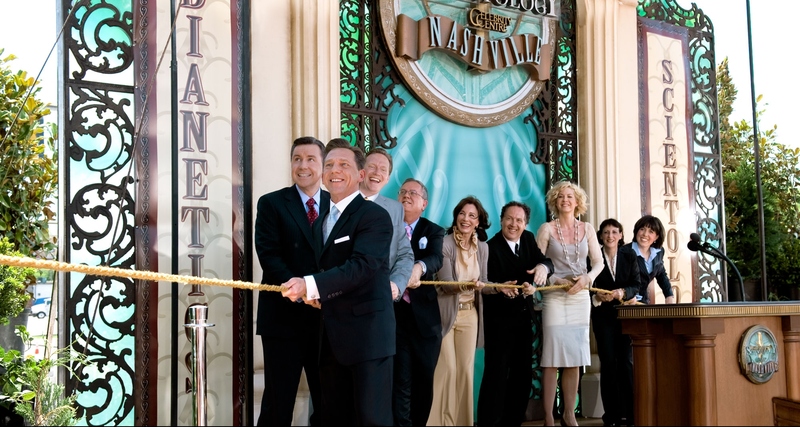 Mr. Miscavige led the ribbon cutting ceremony, joined by Church executives and special guests, to officially open the doors of the Nashville Church of Scientology & Celebrity Centre to all. Speaking to the broader significance of a Church of Scientology in the heart of Music City, Mr. Miscavige dedicated the new Church:“The new Ideal Org and Celebrity Centre signals great things for tomorrow. And when you couple that with our ability to recover to individuals their inherent creativity, our ability to reawaken dreams and restore the power to achieve those dreams, yes, we can now make good on what L. Ron Hubbard tells us regarding the artist as creating the beauty and glory on which cultures depend. With that, the ribbon was cut and the new Church in Music City, USA, opened to all to begin writing that new song. World’s first Church of Scientology, formed in 1954, now joins a global roster of Ideal Churches of Scientology, poised to serve its growing congregation and the community for the coming decades. 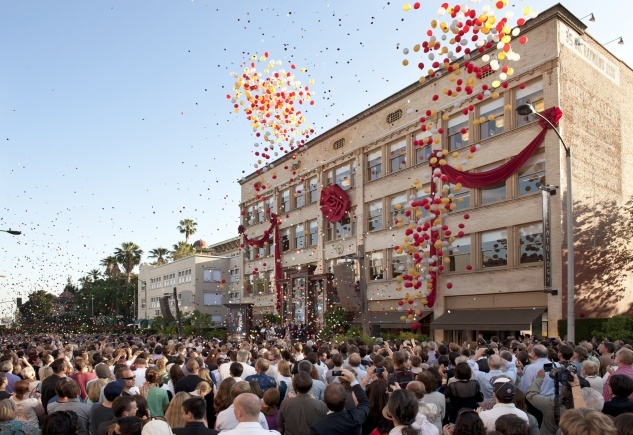 LOS ANGELES—With a fanfare of trumpets and balloons floating aloft, 6,000 parishioners and guests cheered as the ribbon was cut, opening the new Church of Scientology of Los Angeles on Saturday, April 24, 2010. Mr. David Miscavige, Chairman of the Board of Religious Technology Center and ecclesiastical leader of the Scientology religion, officiated at the ceremony dedicating the new Church, joined by parishioners and Los Angeles-area officials. The ceremony marked the conclusion of the fullscale redesign and construction of the Church’s 64,571-square-foot property at the corner of Sunset Boulevard and L. Ron Hubbard Way, now fully reconfigured as an ideal Church of Scientology which also serves as a training center for Church executives and staff from around the world. Drawing from those Art Deco roots of 1920s Los Angeles, the fully reconstructed Church evokes the architectural revolution that contributed to putting the home city of the first Church of Scientology on the planetary cultural map. In addition to an expansive Chapel are many unique elements including an extensive public information area of 20 multimedia displays, a library, seminar rooms, film rooms, volunteer workspaces for its many social and community programs and projects, as well as course rooms that seat over 480, with 35 rooms especially appointed for the religion’s one-on-one spiritual counseling. The Church of Scientology of Los Angeles was incorporated in 1954 as the first Scientology Church in the world. The Greater Los Angeles area is the seat of the religion’s Mother Church, Church of Scientology International, and Bridge Publications who publish and disseminate Mr. Hubbard’s books and recorded lectures for all of North America. Worldwide, there are more than 8,500 Scientology Churches, Missions and affiliated groups in 165 countries. Los Angeles is the fourth new Church of Scientology opened in 2010 and the ninth in the past year. The Brussels branch of Churches of Scientology for Europe was opened January 23. The Church of Scientology of Quebec was dedicated January 30, the first new major Church to open in Canada, and the Church of Scientology & Celebrity Centre of Las Vegas opened February 6. In October 2009, two major Churches were opened: the Founding Church of Scientology of Washington, DC, and the Church of Scientology of Rome. 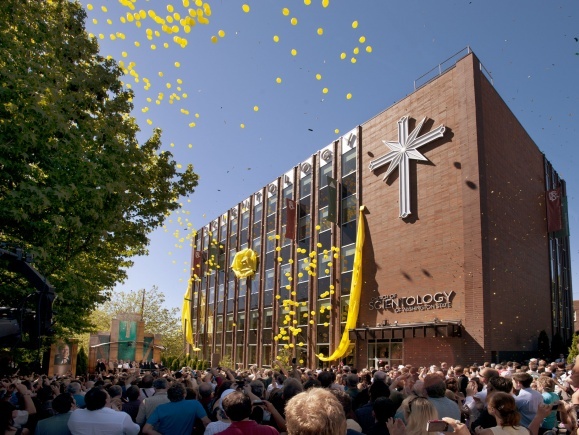 In April 2009, Scientology Churches in Nashville, Dallas, and Malmo, Sweden, were opened. These Churches join the roster of new Churches of Scientology in the world’s cultural capitals, including the National Church of Scientology of Spain in Madrid’s Neighborhood of Letters; the Church of Scientology of New York, just off Times Square; the Church of Scientology of San Francisco in the original historic Transamerica Building; the Church of Scientology of London, located in the epicenter of the city; and the Church of Scientology of Berlin, near the Brandenburg Gate. Another 10 new Churches of Scientology are scheduled for completion before the end of 2010. Fact Sheet: L. Ron Hubbard – Who is he? Madrid, Spain—The Spanish Tax Agency has recognized the Church of Scientology of Spain as a social non-profit organization, granting a certificate of recognition in Madrid on November 30, 2009. Since the founding of the first Church of Scientology in 1954, Scientologists have been actively involved in the improvement of their communities and society and have received thousands of awards and commendations for their work in communities all over the world. Scientologists sponsor a large, effective drug abuse public education campaign and have been conducting anti-drug activities since the early 1980s. The Church also sponsors an international human rights awareness campaign in coordination with United for Human Rights and Youth for Human Rights International. This campaign features guidebooks for children and adults, illustrating the United Nations Universal Declaration of Human Rights. The Church’s most embracive effort to provide help to the world at large is its Volunteer Minister Program, with more than 203,000 volunteers trained internationally. The value of these services has been recognized by politicians, police, the military, other relief agencies and civic authorities. Church members support and contribute to the Red Cross, children’s hospitals and numerous other community groups around the world. This support ranges from broad participation in drug-free blood drives, to citywide collection of holiday toys for needy children, to donations of food and clothing for underprivileged families. Ivan Arjona, the Public Affairs director for the Madrid Church stated the Tax Agency recognition will assist the Church in furthering humanitarian programs throughout Spain.